Finally, the answer to perfectly cooked meals at home! Hundreds of the top gourmet restaurants around the world use this new technology in their modern kitchens and we've got their secret to share with you! 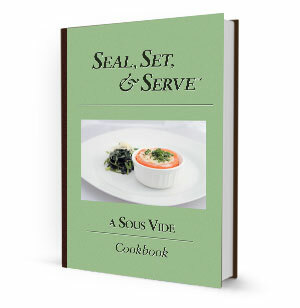 Seal, Set, & Serve is a Sous Vide cookbook that reveals over 60 delicious gourmet dishes you can easily make in your own kitchen. Produce meals of incomparable taste and texture - cooked to perfection every time - without shrinkage or loss of nutrients. Discover the simple secret to gourmet perfection.